Really impressed with the Adirondacks so far. The whole area is full of lakes with houses scattered around their edges where there is access to the lake side. So far we have not had much sunshine. Mornings are partly cloudy and nice, followed by overcast and rain in the afternoons. This does detract from the sight seeing but the beauty of the area still shows through. Going to be here in Old Forge for a few days and then will end up in Wilmington for about a week. Ted is going to do a little fly fishing on the AuSable river near Wilmington. This doesn't show the true beauty of the place - no sun of course - but it is quite beautiful. We went to a place called the Adirondacks Museum in Blue Mountain Lake. This picture is taken from a porch on one of the buildings. There are many different aspects of local history presented. Interestingly enough this history purports to start somewhere around the early 1800's. Not too politically correct! Anyway it is just the history since the white man "discovered" the area. For what it presents, it is extremely thorough and very well done. We spent several hours in the rain and sun investigating canoes, trains, architecture, design and so on. Think this should be on the "must do" list if in the area. Old Forge is situated on First Lake and is a popular destination in the Adirondacks. We are camped just north of Old Forge on Route 28 on a lake named Serene. 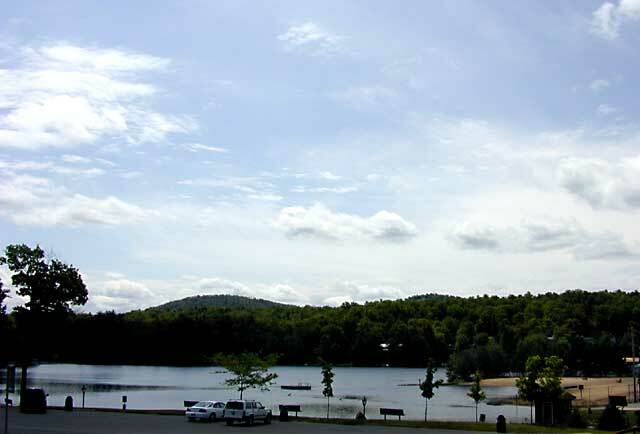 Old Forge Camping Resort is very wooded and a great location for sight seeing in this area. This is a water wonderland with boating and fishing available as well as cruises of the chain of lakes from First Lake to Eighth Lake. 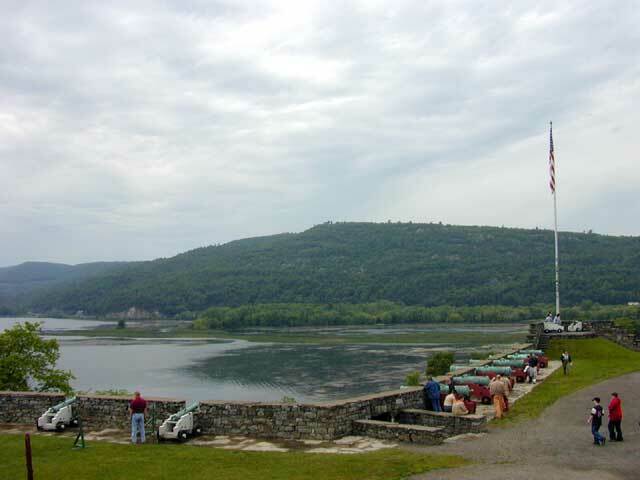 What we now call Fort Ticonderoga was originally built by the French in 1755 and called Carillon. 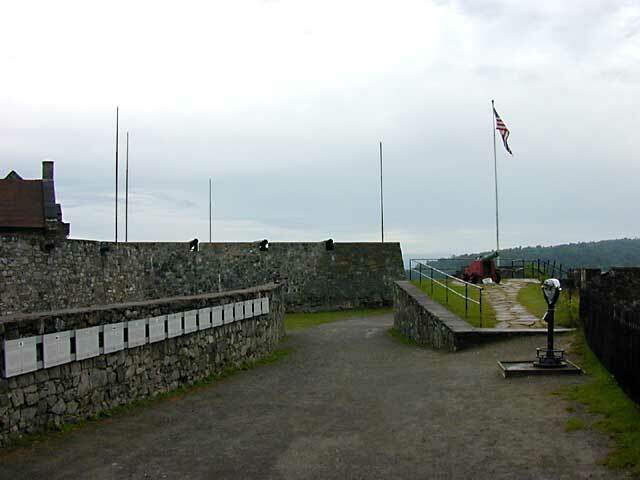 It was the site of the greatest French victory of the Seven Years War on July 8, 1758. 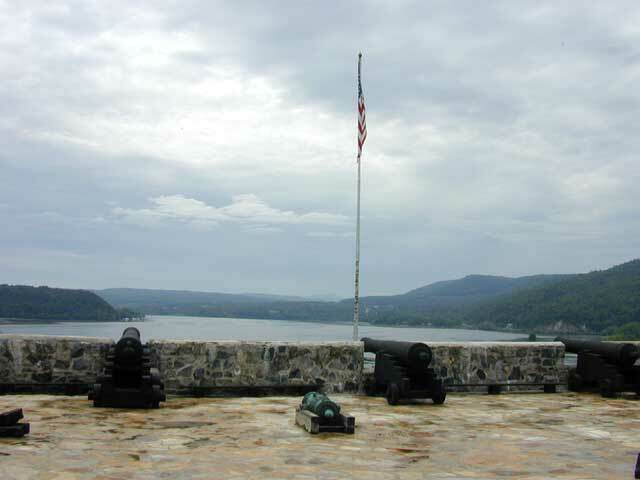 It was also where the first American victory of the American Revolution occurred when it was captured by Ethan Allen, Benedict Arnold and the Green Mountain Boys. After it was abandoned and had collapsed, it was cannibalized for building materials by the farmers that moved into the area. 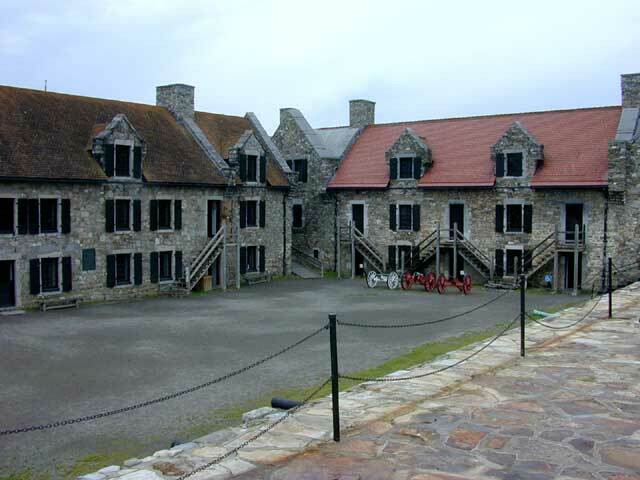 It has now been restored and is a great place to visit for those interested in American history. Lake Placid is the site of much of the U.S. training for the Winter Olympics for ice skating, ski jumping, hockey, luge, and more. 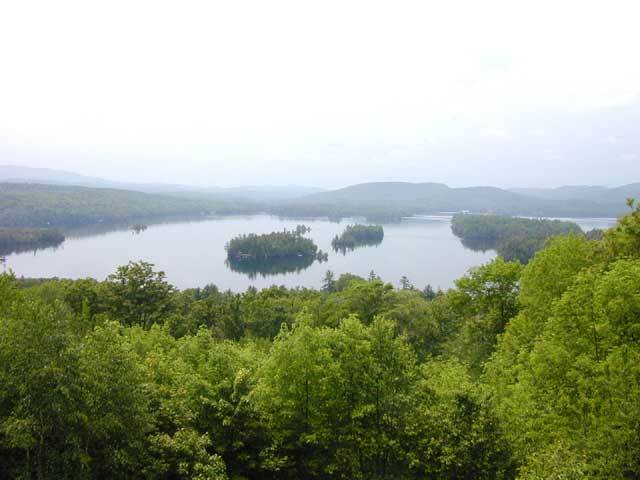 It is located in a beautiful area of the Adirondacks on two lakes. Very much a tourist destination, but lots of fun anyway. The AuSable river is nearby and has some of the best fly fishing in the East. Check out Fran Betters' Adirondack Sport Shop located in Wilmington, NY. 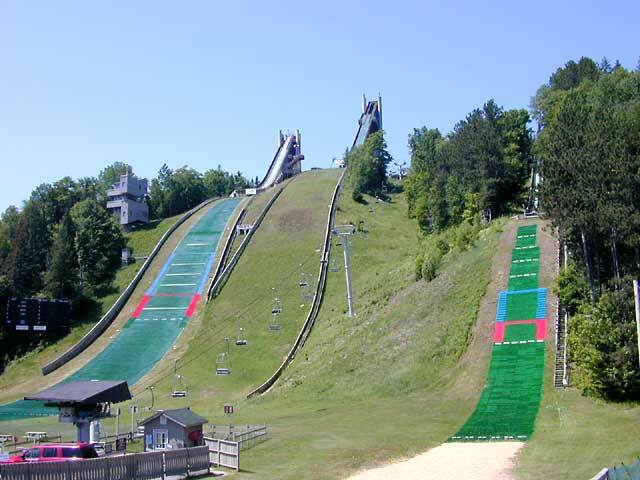 This is the Ski Jumping Center at Lake Placid. Two of the jumps are set up to allow training all year round. The slopes are covered with a plastic straw that is about 12-14" long. It is laid on the slope in over lapping rows. The ramps have plastic guideways that are nubbed on the bottoms. The guideways have water running down them when in use. This provides minimum friction for the ski bottoms when running down the ramp. The plastic slope is also wetted to lower the friction. The 90 meter jump is on the left and the 70 meter one is on the right. The 120 meter jump in the center is not set up for year round jumping. 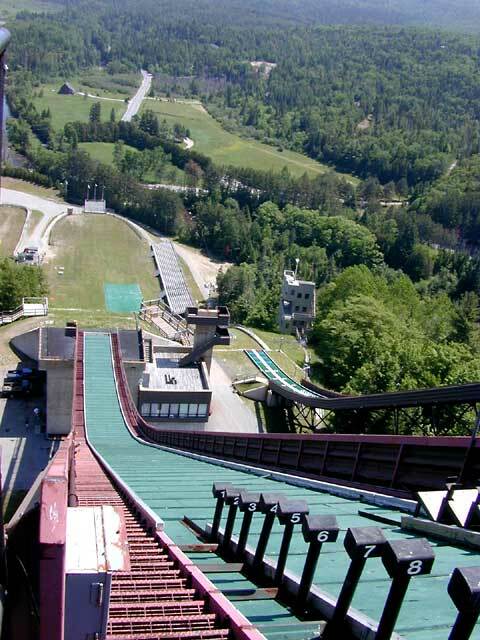 This is what it looks like at the top of the 120 meter ramp, looking down from the position the jumper would be when starting a jump. The vertical drop of this jump is over 400 feet. After standing up here, and looking down this ramp, I have a much better understanding and admiration for the folks that do this sport. WOW!